There are “Up North” getaways, and then there are “Up North” getaways that provide an honest-to-goodness, get-back-to-nature experience. The Kingsley Motel is one such place. Built in 2007, this newer property is located just 10 miles south of Traverse City. It’s situated right off the snowmobile trails and is rock-tossing distance to thousands of acres of state land—perfect for hunting, fishing, hiking, etc. “You really get back to nature here,” says Owner, Nick Anton. 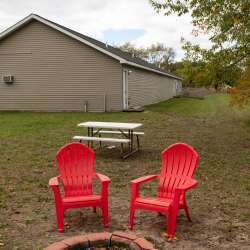 “We get a lot of people who come specifically to enjoy the great outdoors.” For added outdoor enjoyment, the motel has a large fire pit and horseshoe area. The beauty of nature isn’t just outside either. The rooms at Kingsley Motel reflect the feel of Northern Michigan too. The newer log beds and furniture are both sturdy and stylish. The tasteful brown and green colors give each room a cozy, cabin-like feel. 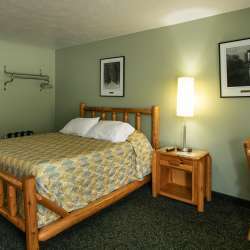 The motel offers 11 rooms, some with a kitchenette, which are popular with guests staying longer than a night or two. Perhaps best of all, the room rates are among the most affordable in the area.